December 2012 Birchbox – Merry Christmas! I am really pleased with this box! Why? That Benefit Facewash/scrub combo was EXCELLENT. It smelled wonderful and the samples lasted forever. I have been saving all my fragrance samples and eBaying them as mini fragrance sample lots. Haha. Merry Christmas Everyone! I got one present early–I was selected for my first Influester box, the Holiday VoxBox! Exciting! I’m sure it’ll be full of all sorts of Holiday/Seasonal goodies which I’ll be sure to blog about once they come in. 🙂 If you’re interested in trying Influester, join me and click here! We’ve been celebrating and combined with all of the Christmas festivities and other things going on, I haven’t had the time to post like I used to. And now, I think I’ll be even busier! Wedding Planning, I’m so excited. Gosh, B even talked to my parents after I told him how it important it was to me/them. I teared up and everything. On a side note, I hope everyone’s holidays are going great so far! Have you been enjoying the (skinny) peppermint cocktails like I have? Do any of you enter the Allure Free Stuff Times giveaways? They had a crazy month full of giveaways in August. I entered the contests just for fun but I never really expected to win anything. First 1,100, or 500? Blah oh well. But whatdyaknow! I actually did win stuff! So far, I’ve won a Wet n Wild Mega Liner Liquid Eyeliner ($2.99). I also just got an email that said I won a Goody Simple Styles Spin Pin Mini ($7.29). Free stuff is free stuff, right? But actually, it seems like I won a pretty handy holiday party hair accessory. You just twist it in your hair and voila! It works well with fine hair so hurray! I’m going to do my hair like this for our friend’s wedding. But you can also get a little fancy and do something like this! Yeah, perhaps these Goody Spin Pin Minis are for me. My hair doesn’t really like being curled all that much. Are you on instagram? I am! I love that app–it’s like if facebook and tumblr had a good looking baby with equally-good-at-wasting-time skills. So if you need a really nifty gift for the instagram-addicts in your life, look no further than Photojojo’s collection of Phone Lenses! 1. The Photojojo Phone Lens Series. $49 for all three, for the more “pro” photographers in your life. I like them but they stick out a little bit. 2. Easy Macro Cell Lens Band. For the more casual photog, $15 and it lets you take the closest close-up pics ever! I like it because it’s easily removable and I’m addicted to taking close-up pictures of my food. Buy the Easy Macro Cell Lens Band at the Photojojo Store! 3. Jelly Camera Phone Filters. 3 for $15! I think I’m going to break the set up to give to my siblings/cousin. So cute and seems like the most fun! Buy the Jelly Camera Phone Filters at the Photojojo Store! I’m so excited that it’s December!!! 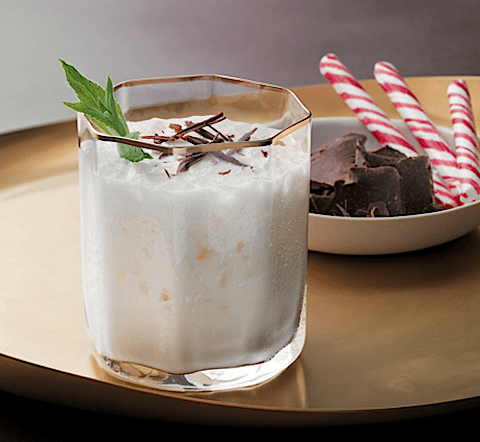 It’s not too early to make Peppermint Crisp Cocktails, is it? Blend the first two, fill with ice cold milk, and add a few ice cubes. Voila! I’d throw in a candy cane and some shaved chocolate over the top. Mmm. I swear, there’s something special about making these (and enjoying them) IN December. Enjoy!